St Bloggie de Riviere: Careful What You Say! We've had blanket, carpet, wall-to-wall coverage of the Charlie Hebdo+ tragedy in the French news for the past week. It's not that I don't deplore what happened or am not interested. I do and I am, but it's been a week now, and there are other things happening in the world. Little things probably, like two thousand Nigerians massacred by a young girl suicide bomber sent into the crowds by Boko Haram. That got a five-second slot at the end of the news on Monday. Not important enough for more I suppose only five days after the French tragedy, and not a word more since. Or how about the rise of the Swiss Franc, or indeed the news about Gazprom? David Pujadas, the France2 news anchor seems to have been relishing all the CH-related items. He's been more alert and intense this week than normal. It has to be said, the tragedy has been a hot subject for news teams, and they have absolutely made the most of it and more. It's not often such a 'gift' is handed to them. In moving speeches applauded by one and all, Hollande vowed to uphold his commitment to free speech. Unfortunately, it's all just empty words. Free speech has been under attack for decades, modified by one law after another. 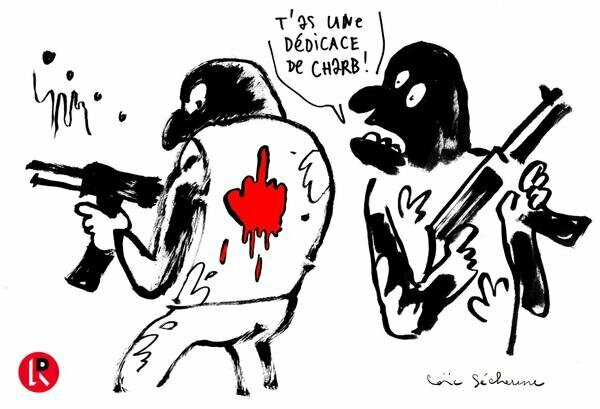 There are two catch-all phrases used by the hounds of SOS Racisme and their ilk to stamp on free speech: incitation à la haine (incitement to hate, which seems to include offence these days), and apologie de terrorisme (justification for terrorism). Last weekend, millions of people marched to defend free speech (not sure which one though - the original one or the hobbled one), but this week already, a bunch of some fifty cretins were hauled up before the courts for apologie de terrorisme, and a further 200 'incidents' have been reported in schools. In shocked tones, it was reported that some kids refused the minute of silence to honour the dead, and some even said the cartoonists had it coming. I do wonder on what planet the msm live sometimes. Of course there will be kids saying this. They probably come from households where the parents say it too! « aligne le régime des récidivistes sur celui des non-récidivistes en matière de réductions supplémentaires de peines ». She wants to align the regimes for recidivists and non-recidivists when reducing sentences. A first offender might expect a light sentence for something and get off with a fifty percent reduction. Now, the hardened criminal with eighty condemnations under his belt will be able to expect the same fifty percent reduction. While Valls does his utmost to arrest the terrorists, Taubira orders their release asap.This jaw-dropping directive was published on January 9 in the midst of the hostage situation. As Littlejohn puts it, you couldn't make it up. What to do about terrorism in the name of Islam, though? In my very humble opinion, I think it's time Islam caught up with the 21st century. Like Christianity before it, Islam needs to be modernised. Catholics no longer have the Spanish Inquisition to worry about, or witch hunts, or any other such barbarities, and it's time for Islam to grow up too. The process has started. In Egypt, el-Sisi, the president, is calling on imams to implement reforms so that Islam is no longer seen as a source of 'destruction'. In the UK, people like Sara Khan of Inspire, a counter-extremist Islamic forum, are calling upon the Muslim community to develop a British Islam in harmony with British values rather than perpetuating an unhelpful 'grievance narrative'. Is there such a group in France? When I did my degree in Arabic and Islamic Studies, we learned that back in the ninth century, the door to interpretation of the texts was closed by scholars who decided that everything that could be said had been said, and there was nothing more to add to the study of Islamic texts. It is this 'closing of the door of interpretation' that has kept Islam so static. You can imagine how difficult it will be to open it again in order to remove obstacles to modernisation. Hard-line scholars are totally opposed, and behind them, probably, maint vested interests. Still, I can't see a resolution to the world's terrorist issue without a thorough overhaul of all Islamic texts and reinterpretation of sacred words in the name of Peace. Such a small word, such huge repercussions. Boycott Saudi Arabia for a start....but it would be an uphill task to get western governments to do anything about this pariah state. Indeed, they are totally against any form of modernisation. For them, flogging a blogger who calls for reforms is an acceptable act! Let the women rule, that may be the answer? I think it's interesting that, after the initial news frenzy and outrage, certainly in the UK there seems to be some useful debate about where we go from here. Certainly the realisation that many of the politicians who appeared in that photoshoot have their own house to keep in order with regard to free speech has sparked much discussion. I totally agree, especially the Turkish guy who has locked up, what is it, seventy journalists?! It was wall-to-wall here in the USA for perhaps slightly less than a week. I was glad of it, being highly interested in the details myself. I wrote something about it in both the main wikipedia and the rational wikipedia, including my translation of the dialogue between Coulibaly and his Hyper-Cacher hostages -- recorded and transcribed by RTL thanks to a telephone that was mal accroché. Not to my surprise, this was immediately deleted by another editor with the comment "We'll be having no Islamic propaganda here, thankyou." I wouldn't say that Coulibaly's manifesto was particularly true, actually. Here's the original French. I too had had enough of the coverage after about three days worth of the same ol same.